WA mixed farmer Scott Welke in a regenerating stand of serradella. 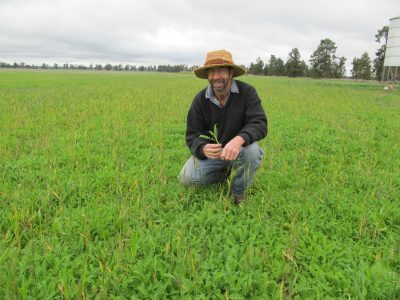 A RIP-ROARING drought and buoyant livestock prices have bolstered interest in hard-seeded legume pastures as a worthy inclusion in mixed-farming rotations in New South Wales. Already a favourite in some Western Australian farming systems, the Mediterranean natives and their spin-offs can last for years in paddocks which can host simultaneous cash crops, and are being considered as an alternative to subterranean (sub) clovers and medics. Generating interest are species including arrowleaf, bladder and gland clovers, hard-seeded French serradella and biserrula. Natives sourced from the Centre for Legumes in Mediterranean Agriculture (CLIMA) and investigated in WA by the Murdoch University, University of Western Australia, CSIRO and WA’s agriculture department introduced hard-seeded pasture legumes to Australia in the 1990s. Part of their initial appeal was their ability to increase the amount of groundcover provided by winter-crop residue in the face of wind and rain events over the summer fallow period. The hammering topsoil in parts of NSW has received from dust storms in the face of failed or low-yielding crops due to drought has boosted eastern-states interest in them. Global Pastures director Neil Ballard is a long-term proponent of hard-seeded pasture legumes, and grew Santorini, the first serradella variety, when it was released in WA in 1995. In WA, he said concerns about herbicide resistance and high expenditures on artificial nitrogen were continuing to boost interest in hard-seeded pasture legumes. He said farmers from eastern states who wanted to maximise their earnings from livestock with a resilient and flexible pasture base have been contacting him more frequently in recent times. “They allow you to alter your crop-to-pasture ratio, and your crop-to-livestock ratios, and you can also reduce your dependence and outlay on artificial nitrogen,” Dr Ballard said. “Now that sheep and wool and meat are providing a strong level of return, some people are thinking cropping by itself isn’t doing the land any good. Dr Ballard said some cropping operations, including that of users Colin and Anna Butcher at Brookton, 120 kilometres east of Perth, are saving tens of thousands of dollars per year by growing hard-seeded pasture legumes which have reduced their need for artificial nitrogen. The Butchers have also been able to grow wheat crops yielding up to five tonnes per hectare, with no response to artificial nitrogen shown in barley, canola and wheat crops, in paddocks after hard-seeded pastures. “We’re not growing better crops, but we’re growing similar-yielding crops with lower input costs and reduced production risk,” Anna Butcher said. Table 1: Results from a DAFWA and Murdoch University trial site on Colin and Anna Butchers’ Brookton, WA, property where Mace wheat was grown in 2013 following a year of serradella. Dr Ballard said most new species are “incredible nodulators” compared with sub clover. A further agronomic benefit of hard-seeded pasture legumes is their ability to promote rhizobia populations, which help crops absorb nutrients in the soil. Less reliable rainfall patterns have contributed to mixed farmers looking for an alternative to sub clovers and medics for their pasture phase. 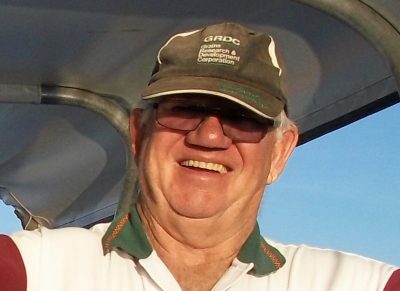 “Sub clovers and medics have shallow root systems, and the seedbank can be depleted through false breaks in late summer and early autumn where seedlings die dry springs, because they can’t access deep moisture and set seed,” NSW Department of Primary Industries soil unit researcher Belinda Hackney said. Management has also played a part in the loss of popularity in sub clovers and medics in some districts. Dr Hackney is involved with a number of trial sites, including one at Ungarie, northwest of West Wyalong, which got 90 millimetres of growing season rain in last year’s unusually dry growing season. 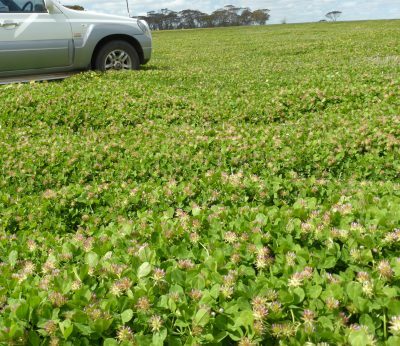 Sub clover set no seed, medic set less than 10kg/ha, and biserrula set 170kg/ha, which exceeds the benchmark rate of seed set of 100-150kg/ha. South of West Wyalong at Beckom, farmer Mike O’Hare was introduced to hard-seeded pasture legumes through his hosting of a hard-seeded pasture legume trial conducted by Dr Hackney in 2009, when dry seasons had depleted sub clover seed banks. The O’Hare farm covers 2200 hectares, and is 50/50 split between sheep and cropping in a 475-millimetre annual average rainfall area. Mr O’Hare grows biserrula on its own, and has some area planted to a mixture of arrowleaf, bladder and gland clover, and additional area with barrel medic. 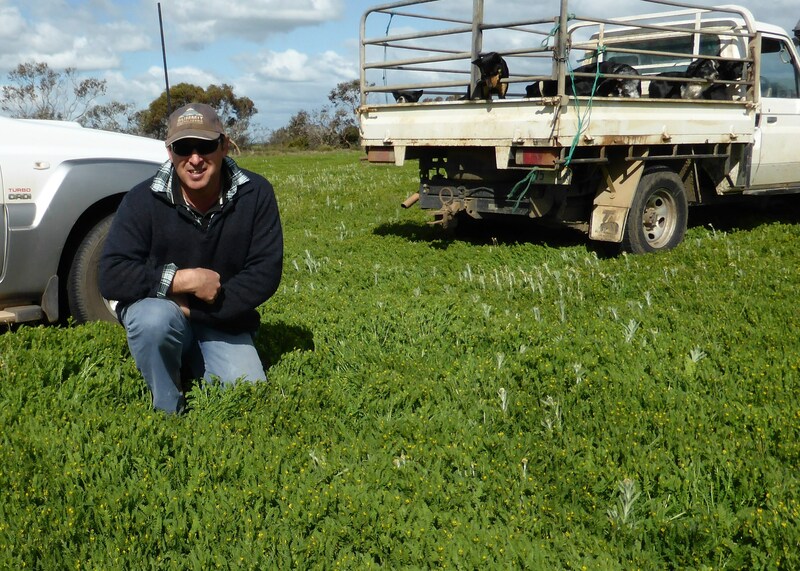 Esperance-district farmer Scott Welke, Cascade, first experimented with serradella in the early 2000s as a means of dealing with red- clover syndrome. “Red-clover syndrome makes subs underperform and become Bonsai, particularly with an early break,” Mr Welke said. “Our sub clover base was diminishing, and we couldn’t carry as many sheep as we used to, so I got into Santorini serradella as an annual to put in with subtropical perennials. “It’s worked well on acid white sands. Mr Welke said the farm’s area was split half and half between cropping and sheep, but the improved productivity in their pastures since serradella was introduced has allowed them to run the same amount of sheep on 30pc of their country, and crop the other 70pc. “It’s a deep-rooted plant, and can hang on into December if get a late rain in spring. Mr Welke harvests his serradella every year, and inoculates the seed. “We use lifters to harvest, as if you were harvesting peas or lentils. Now that the sun has set on suction-harvester manufacturing, hard-seeded pasture legumes are making mechanical as well as agronomic sense. Suction machines are essential for harvesting sub clovers, and handy for harvesting medics, but have become difficult to purchase second-hand, and problematic to fix due to the shortage of genuine parts. “The practical thing about these hard-seeded pastures is you can grow and harvest your own seed with a conventional header,” Dr Hackney said. Seed harvested on farm has very high hard-seed content, and new methods of establishment — summer and twin sowing —have been developed to allow cheaper and timelier methods of pasture establishment. With summer sowing, hard seed, or pod segments in the case of serradella, are sown in summer. High summer temperatures break down the hard seed, and plants germinate on opening autumn rain. Summer sowing also allows pasture sowing to be completed before winter-cropping program begins so labour can be used more efficiently. Not all hard-seeded species and varieties are suitable for summer sowing. The hard-seeded French serradella varieties Margurita and Erica developed by Dr Brad Nutt of Murdoch University and bladder clover work well for summer sowing in WA and NSW while, arrowleaf clover and biserrula have also been successful in NSW. Twin sowing involves sowing hard seed or pod segments with the last crop in the cropping phase. The hard seed breaks down during the final year in the cropping phase, and emerges on the following autumn rain. Hard-seeded French serradella and bladder clover have performed well in twin sowing trials and commercially in WA and NSW. Both summer and twin sowing require use of 20-30kg/ha of serradella pod or 10-15kg/ha of unscarified seed. The new legumes can also be sown conventionally in late autumn using purchased scarified seed sown at 5-10 kg/ha, a similar rate to sub clover. Hard-seeded pasture legumes will germinate when their outer seed case breaks down due to rain, time or temperature variation. “The idea is to get as big a seed bank in the ground as you can” Dr Hackney said. Mr Ballard said planning ahead was needed to get seed into the ground before the break and maximise germination response on the next rain. Crop in year two and return to a pasture phase in year three. “Follow this three-year discipline, and you will be set up for life,” Dr Ballard said. Once a seed bank is established, hard-seeded legumes are very persistent. It is generally a good idea to manage the species to allow for good seed set at least every two to three years following initial establishment to keep seed bank numbers high and ensure robust pasture regeneration. In their native Mediterranean habitat, hard-seeded pasture legumes withstand very heavy grazing. “These plants have survived uncontrolled grazing by sheep and goats in the Mediterranean for hundreds of years,” Mr Ballard said. Mr Ballard said new species leave a good body of dry feed in the paddock which does not deteriorate with the amount of summer rain which would normally ruin sub clover. “They allow you to establish pastures in a different way. Dr Ballard said serradella and biserrula are also beneficial in breaking the cycle of nematode population build-ups for both Pratylenchus neglectus and Pratylenchus thorneii. “Many growers are including them in their rotation mainly for that reason. “Sulla, which isn’t grown much in WA, serradella and biserrula are the three best options for breaking nematode-breeding cycles. While some aspects of mixed farming (think triticale) have trouble attracting funding dollars, research into hard-seeded pasture legumes has drawn broad and recurring investment. Programs are currently supported by the Federal Government’s Rural R&D for Profit program, the Grains Research and Development Corporation, Meat and Livestock Australia (MLA) and Australian Wool Innovation (AWI). Research partners include grower groups, Charles Sturt University, NSW Department of Primary Industries, CSIRO, Murdoch University, the South Australian Research and Development Institute, and WA Department of Primary Industries and Regional Development. Dairy Australia and the Rural Industries Research and Development Corporation have also contributed in the past. Researchers are now evaluating and developing species and varieties to cope with challenging environments such as high-boron and high-aluminium soils, and earlier-flowering varieties for low-rainfall areas.